They stood in the long, outdoor aisle of Fences and Decking at Home Depot. She studied chain link, while he inspected pre-fabricated vinyl panels and planks of untreated wood. The afternoon sun was so terribly bright and heavy that she imagined it dropping from the sky and burning everything before her. She looked up, toward the whirring buzz just above her head, and watched a bottom-heavy carpenter bee slowly bore another hole into the old wooden scaffolding that held the thick coils of chain. The new hole was perfectly round, like the others. She’d watched the bee work the night before, and the night before that when they had come here, arguing over which kind of fence would keep the dogs in the yard. Now, she glanced at her husband as he walked toward her, dragging something behind him. The air smelled and tasted metallic – junkyardy – and everything around her was sharp and unyielding. He pulled a white panel, about two feet tall, in front of him. “What about this?” he asked. The pickets were scalloped, suggesting a peaceful elegance, a bit of Southern comfort, she thought. She shook the vinyl pickets, testing their strength. “It’s stronger than some of this other stuff,” he said. “It’s not tall enough,” she said. He set the panel against the scaffolding and rubbed his face. That – the face-rubbing – had started last year, before she had understood what happened, in the time when he vacillated between angry and inward, and the dogs slinked around the house, ears lowered, confused by his shifting energy. She turned away from him, watched the bee twitch and waver, then begin another hole. Farther down the aisle, another couple began loading wooden pickets onto a cart. She watched as the man and women lifted the wood from the shelf, each one holding onto an end. Their t-shirts were not damp with sweat nor were there any wrinkles in their shorts or telltale signs that they’d dressed without caring how they looked. She hated them a little. She moved toward the couple. Down here, the wood smelled stronger, she thought. More natural, more like something that had once been a valiant, living thing. “We could do it ourselves,” he said, following behind her. “We’re not do-it-yourselfers,” she said. “We’ve done it before,” he said. “Everything we’ve tried ends in ruins,” she said. “I just don’t want to worry anymore,” she said. “We’ll paint it.” he said. “It’s still not tall enough,” she said. “There is nothing else,” she said. “We’ll get whatever you want,” he said. “I don’t know what I want.” she said. She looked at him. His face had become more creased and worn down, and it hurt her to see him this way, appearing so much older than he was. He let go of the panel. The harsh thwack of wood against concrete echoed through the warehouse. “You’ll never trust them, will you?” he asked. “I do, I trust them,” she said. “They haven’t proven they can be trusted,” she said. She walked back toward the old shelf where the bee continued to saw and drill its way into the wood. If she squinted, she could see the tiny wood shavings sparkling in the sunlight as they drifted down from the hole. Inside the thick wood, she knew the bee had a network of tunnels, possibly some eggs waiting to hatch. She’d read about carpenter bees last summer when she’d noticed a few holes in the eaves around their porch. The bees worked the hardest in the mornings as she sat on the porch swing with her coffee, waiting for him. The males, she knew, had no stingers and the females would only sting if mishandled. They meant no harm, really. She knew that. But as the summer wore on, she became increasingly obsessed with them. One morning, after she’d watched them for a long while, she grew so angry at their invasion and the number of holes in the wood that she went to the garage and found a roll of duct tape. It made no sense to her why they had, out of all the houses in the neighborhood, targeted theirs. She cried as she placed tape over each hole, hoping to suffocate the bees in their nests. Before she finished with the holes, she heard the droning sound of a bee sawing through the thin material, and watched as one bee, then another escaped. Defeated, she had thrown the roll of tape into the bushes. Hours later, he had found her on the porch, the sobs coming in waves, her face contorted. He had picked her up and carried her into the house and told her what she already knew. Now, as the bee disappeared inside its new hole, she felt his hand press against the top of her back. His palm was so hot against her bare skin. A woman approached them. It was an older woman, her orange Home Depot apron stained with paint and turpentine and topsoil. Two pencils criss-crossed through her greying hair, holding it back from her damp forehead. She glanced at him and opened her mouth to speak, to laugh at the simple word they had uttered in unison. He gave her a little smile and nodded. She felt a loosening in her body, a gentle unraveling. Awkwardly, she reached for his hand, as if touching him for the first time. “We’re fine,” she said to the woman. She thought about the dogs, how they would rush to the door to greet them, tails wagging, welcoming them home. She would step aside, let them out. And then she would run with them, through the yard, the neighborhood, to the sky and sun. 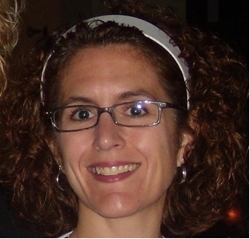 Amy Purcell, of Kent, Ohio, is the winner of The Writer 2012 Short-Story Contest. In her story Home Repair, Purcell isolates an original and revelatory moment in the lives of her characters who find themselves faced with a small, seemingly manageable problem, and yet in trying to solve it, the various fissures in their relationship start to tremble like fault lines, said one of the finalist judges for the contest. The story will be published in the February issue of The Writer. Purcell’s work has appeared in Third Coast, Beloit Fiction Journal, Storyglossia, Timber Creek Review, 34th Parallel and Rubbertop Review. A part-time graduate student in the creative writing program at Kent State University, Purcell works full-time as director of corporate communications for Luxottica. She lives with her husband David and two Australian Shepherds, Alice and Macy.